Since Panini announced their initial plans for 2011 National Treasures Football, they've mentioned a massive trading card that would trump anything collectors had seen before. The world's longest trading card has finally been unveiled. The book card includes autographs and jumbo jersey patch pieces from all 36 players who participated in the 2011 NFL Players Rookie Premiere prior to last season. On some of the cards, each player signed directly on the patch piece. They also inscribed their signature with a cheer for their team. 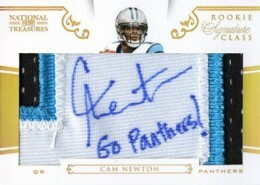 For example, Cam Newton wrote, "Go Panthers!" Measuring more than eight-feet long, the card is like 36 separate cards connected with hinges. The result is a behemoth. Understandably, the card was distributed via redemption. Five redemption cards were randomly inserted in 2011 National Treasures Football boxes. If I pulled it, I send it in to get graded!! WFT would they do with it? Ryan VanLanen (ID 39909) � It’s doubtful you’d be able to. Grading companies state the dimensions of items they’re able to grade. 2011 National Treasures Factory Sealed FB Hobby Box Cam Newton AUTO ROOKIE ?? ?